Tesco Broadband – For Masochists Only (aka my schizophrenic router) – nerd. So, I moved to a new flat in November and obviously one of the first things I did was order a new broadband connection. Tesco Broadband were the cheapest I could find for an uncapped package (although it was a close call with plus net) so I figured I’d give them a try. Mistake number one. After indicating I’d need a new line installed (not possible under my tenancy agreement, and not necessary given that the previous tennant’s Sky phone line had been deactivated just weeks before) but said this is just standard, that the BT Openreach engineer would call out and just flick a switch. To be fair this is exactly what happened, but why not say so up front? And why does it take 6 long weeks (not Tesco’s fault I realise, but still frustrating as hell). Absolutely ridiculous broadband speeds for central London in 2013. 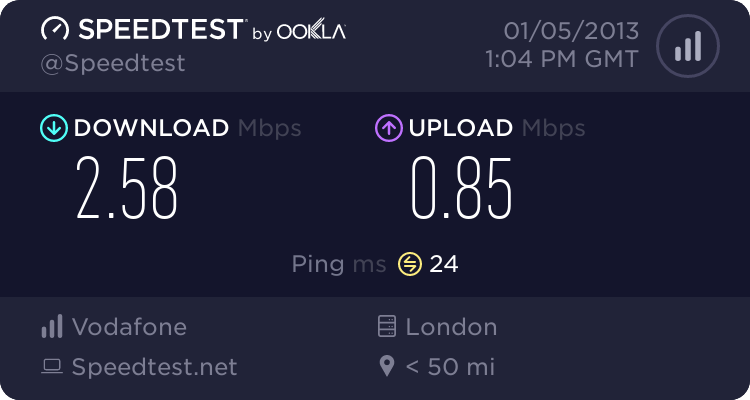 Anyway, after promising speeds “between 8 and 12 Mbps” they flick the switch and I discover to my disappointment I’m getting a lowly 2.5 Mbps – I’m in central London here, not the Outer Hebrides!! No worries, they say it sometimes takes a week or so after connection for the line to automatically adjust to get the best speed. Sure enough, a week (or two) later… nothing. Still the miserably slow speeds I’ve been getting. And some serious swearing. Eventually I send them a tweet deriding my miserable speed and after a bit of to and fro they “open a fault with BT”. Hmm… I am sceptical that this will achieve anything but go along with it. Weeks pass. Nothing. I send a tweet asking for an update. Another week passes. Another tweet. Another week. Nothing. So tonight, I’m getting my home network sorted out with my shiny new powerline ethernet (or “homeplug”) adaptors so I can shift my Microserver out to the spare room. Only when I try to connect my second router up and log into the Tesco Broadband router to get some configuration details I realise that I no longer have a Tesco Broadband router. Oh no, my router now thinks it’s a BT Home Hub. Not only this, but somehow the password has changed so I can’t login – but what I can see is that there are a handful of devices showing up as connected that I don’t recognise, including an Apple TV, an iMac, an iPad and an Asus router. Now I don’t own any of these devices and my router has WPA2 encryption on… doesn’t it? I checked and the wireless key is still active, so how did these devices connect? When I tried to connect to my Tesco (Technicolor) router, I realised that it now seemed to think it was a BT Homehub. I wonder if BT and/or Tesco have done something as part of this fault resolution process without telling me, like forced some new firmware or something down the line. I’ve no idea and I ended up on hold for about 40 minutes trying to talk to someone in Tesco’s technical support. I was just about to give up getting someone before 10pm when a friendly sounding voice came from the phone, just as I’d left the room for a minute to plug something back in in the living room. Thankfully he didn’t hang up when it took me a second or two to come back and even more, he sounded like he actually knew what he was talking about rather than just reading off a script. When I mentioned my firmware theory he at first seemed sceptical but having exhausted the other options (basically that I’d connected to someone else’s WiFi or a different router) he said he’d have to pass it on to Level 2 support, but gave me the username and password I needed to use my other (non-compromised) router until they came back to me and told me what the hell was going on. So, erm, yeah… Apparently there isn’t a big conspiracy and nobody is invading my router. Turns out this is just what happens when you setup your HomePlugs in a flat without security and the flat downstairs is also using unsecured HomePlugs, and just happens to have a router using the same IP address.